Dilworth is one of Charlotte’s most desirable neighborhoods and happens to be the city’s first streetcar suburb. East Boulevard is the heart of Dilworth and is the main thoroughfare with restaurants, retail shops and everyday necessities close at hand. Dilworth’s borders are formed roughly by Morehead Street, South Boulevard and Ideal Way to Freedom Park. The neighborhood’s charm comes from its many 1920s to 1940s homes that have been converted to local businesses and offices as well as the residences that have been lovingly updated and renovated. The neighborhood is mainly bungalows, however, there are a few Queen Anne and Colonial Revival homes. Dilworth’s side roads and Dilworth Road East and West have sidewalks shaded under centuries old oaks, making the neighborhood a comfortably walkable place to enjoy the outdoors and the lush, mature landscaping surrounding homes. Carolinas Medical Center, the area’s only level 1 trauma center, is located on the edge of Dilworth and is just a few minutes away from any point in the neighborhood. Dilworth borders neighboring Sedgefield and South End, which is home to some fantastic restaurants, shops and breweries. People living on the west side of Dilworth can take advantage of LYNX light rail service into Uptown or toward Pineville. Even without light rail, Uptown is just a short walk, bike ride or drive! Dilworth’s central location and beautiful homes make it one of the most sought-after neighborhoods in the city. A renovated home or new construction in the neighborhood can easily cost upward of $1 million. In the last 12 months, a total of 109 homes have sold in Dilworth. Sales prices ranged from $250,000 to $1,624,750, with an average sales price of $731,306 and $282 per square foot. Those sales averaged nearly 98% of list price; many homes sold at or above full list price. 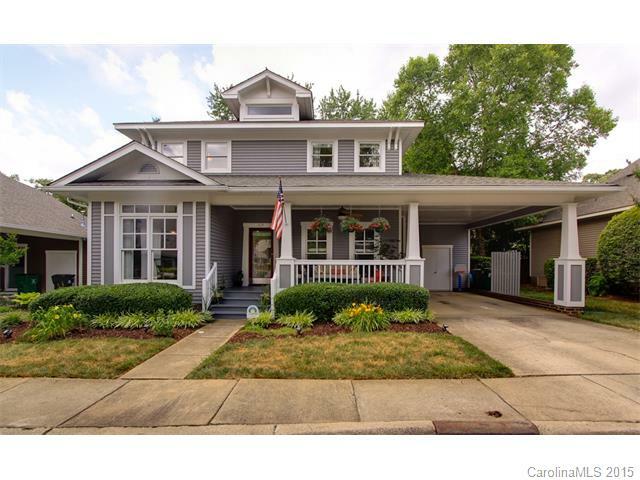 There are currently 32 homes listed for sale in Dilworth, which are a mix of new construction and older, renovated homes. Ten of the properties are under contract as of Sept. 25. List prices range from $387,000 for a 1941 bungalow to $1.34 million for a brand-new modern craftsman home. Dilworth is zoned for some of Charlotte’s top-rated schools – Dilworth Elementary School, Alexander Graham Middle School and Myers Park High School.